The deluge in yields continues. Canada’s benchmark 5-year yield just hit its lowest point since June. The last time we saw this kind of carnage was January 2015. Back then, the Bank of Canada made emergency rate cuts to stave off the oil crisis. Implied odds are slim that the bank will reverse course and lower its key rate near-term. But that isn’t stopping bond traders from thinking it could. In fact, BoC Governor Stephen Poloz said this morning that the current Canadian oil “shock” (yes, he called it a shock) is not as extreme as the 2015 variety, but it is “meaningful” to inflation, and hence rates. He said the BoC is evaluating it and wouldn’t comment on whether it might warrant a rate cut in 2019. Outside of an economic crisis, it would be unprecedented for banks not to lower fixed mortgage rates at this point. 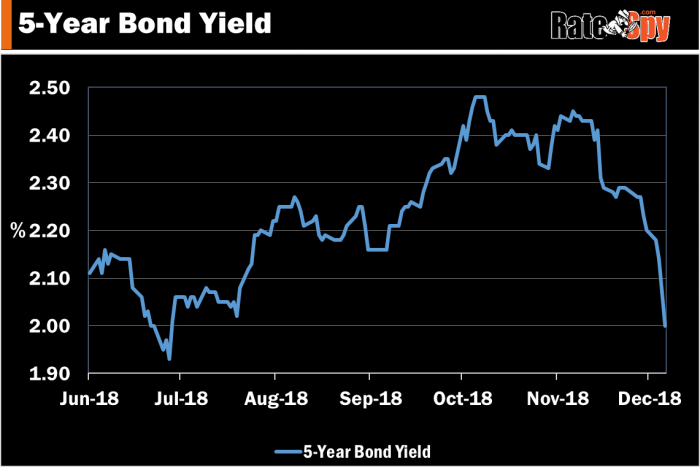 The 5-year yield, which steers fixed mortgage rates, has now plummeted 46 basis points from its November high. As of this morning, however, none have. Banks are okay with testing borrowers’ patience. And patience may be all it takes. Whenever there is a waterfall plunge in yields, it can take several quarters or years to make a new high once again. So banks won’t be able to justify their currently inflated spreads for long. In other words, all these rate hikes the market has been expecting are by no means assured. 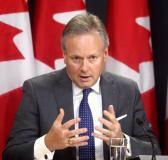 “…Most of our data points have been on the disappointing side,” Poloz admitted. And despite the bank’s recent annual research on the neutral rate, which peg neutral at 2.50% (75 bps higher than today) or more, it’s hard to tell where neutral is until you’re there. The truth is no one can say for sure that we’re not at neutral already. Neutral is the rate that doesn’t stimulate or quell the economy. And Canada’s economy doesn’t feel overstimulated, not anymore. And let’s not forget that economic shocks can change neutral tout suite, as Poloz reminded everyone today. For that matter, no one can say that bonds haven’t over-reacted. All we can do is bet the odds, and for well-qualified borrowers, the odds have now indisputably improved for variable rates. I’m hoping Scotia leads the move back to lower rates. Several people I spoke to inside and outside Scotia acknowledged they were letting competitors like BMO buy up market share. Recently I’ve heard some rumors that they intend to be more competitive in 2019. Scotia couldn’t possibly be any less competitive than it was in 2018. These are certainly interesting times. I still suspect the BoC is being overly optimistic in terms of where they want to see the overnight lending rate. Granted, the latest employment figures helped their case, but positive economic data like that may be few and far between in the coming months. That may well be true Jason. There’s great volatility in StatsCan’s employment estimate and it is largely a backward-looking indicator. What I find particularly odd is that the spread between 2yr and 5yr fixed mortgage rates usually follows the spread between 2yr and 5yr bond yields. Currently that spread is 40-50bps higher for 5yr. Rob, what would you say is the typical lag time between a material shift in bond yields and when lenders adjust rates? The spread between short terms and the 5-year fixed has shrunk, due in part to less competition among shorter terms and higher short-term funding costs (thanks to government policy changes, particularly with respect to bulk insurance pricing). Banks typically following material bond yield declines within 8-12 days, unless due to unusual circumstances (e.g., financial crises, a blow-up in risk spreads, major new capital rules, etc.). But they’re generally slower to cut in December for the reasons noted.